Well, Darwin wrote “On the Origin of Species”. A great book. Not something your average homeless Burger King taxi driving immigrant is reading. Yes, someone needs to teach evolution to the taxi drivers. Heck, I wish someone would teach evolution to my local Kansas School Board officials—who reject it as “just a theory” and obviously a poor competitor to the story of creation that is by contrast infallibly true. But we need the “Origin of Species” first, before those teachers and popularizers and monkey trial lawyers (who, of course, LOST their case) can win in the court of public opinion. The MMP is responding to a request for a coherent, from the ground up, exposition. I have asked several times for patience. Both by those who’d rather just take to the streets now, and from those who want everything explained all at once in an elevator pitch. If at the end of the year you want your money back, tuition refunds will be provided. If you do not need a Primer, go ahead and start the organizing. If you are not interested in MMT, look elsewhere. But if you want a clear and coherent Primer that begins at the beginning, you’ve found the right URL. Accounting Identities. I knew we would have our skeptics. There are two types of complaints. First there are those who are skeptical of identities altogether. To them it looks like we put two rabbits into the hat and then pulled out two and expect applause. Or, it is like saying 2+3=5 and in base 10 math it cannot be anything different. Surely we rigged the results? Well, in some sense, yes we did. We first rule out black helicopters that drop bags of cash into backyards in the dark of night. We also rule out expenditures by some that go “nowhere”—that is, expenditures that are not received by anyone. Finally, we rule out expenditures that are not in some manner “paid for”. If our whole economy consists of you and me (I get to be Robinson Crusoe, you get to be Friday—or vice versa), then if I spend, you get income. If you spend, I get income. I can consume or save, and you can consume or save. We denominate our spending and income and saving and surpluses and deficits in “dollars” and record transactions by scratch marks on the big rock by the pond. We’ve discovered double entry bookkeeping and use it because it is a handy way of keeping track. (We trust each other, but we’ve got bad memories. I accept your IOUs denominated in dollars, and you accept mine.) Ok, so that is the set up—the rabbits and the hat. Nothing up our sleeves. Now I want to buy coconuts from you and you want to buy fish from me. I “pay for” the coconuts by delivering back to you your IOUs and/or I issue an IOU. You “pay for” fish by delivering back to me my IOUs or by issuing an IOU. Let us say I consume $5 worth of coconuts (I return all $5 of your IOUs—crossing off the entry on the Big Rock) and you consume $4 worth of fish (returning to me $4 of my IOUs and retaining $1 of my IOU) because you are more frugal. At the end of the day, I’ve got $5 worth of coconuts but have had to issue a an IOU of $1 (I used all of my income, the $5 earned wages, and you’ve still got $1 of my IOU since you did not spend all your wages); you’ve got $4 of fish plus $1 left of your income (equals your financial saving). My deficit spending has been $1 and your surplus (or saving) has been $1. They are equal (not magically—we put the rabbits in the hat), and indeed your saving accumulation takes the form of a money claim on me (my debt). When we net out all the money claims, what we are left with is the real stuff (coconuts and fish). To be sure, we have left out of this analysis much of what is interesting about the economy—no banks, no government, no “green paper” currency, and so on. All we did was to play a little game of IOU and UOMe. But we did demonstrate the simple sectoral balance conclusion: the financial deficit of one sector (me) equals the surplus of the other (you). And that once we net out the financials, we are left with the real stuff (fish and coconuts). No magic involved. And, yes, we can all of us accumulate in real (nonfinancial) terms. For example, we can all grow our own crops in our backyards, accumulating corn that is not offset by a financial liability. For most of the time humans have been around (after Darwinian evolution) we managed without money. Still, we fed, clothed, cared for, and fought with, our fellow humans. For the most part, the “Modern Money Primer” will be concerned with “money”—that is, the financial accounting part, and it is here where every deficit is offset by an equal surplus (somewhere) and every debt is held by someone as financial wealth—so the net is zero. In terms of our Lake Wobegone analogy, we can all accumulate in real terms (we all have IQs above zero) but our finances net to zero (our IQs average to—well—average). Second, some readers have preferred to come up with alternative identities. Yes, you can do that. We can choose to divide up into alternative sectors: rather than going with private domestic + government + foreign, we could divide into sectors according to hair color: blonde + black + red + blue + brown + silver etc…. For our purposes (to come in subsequent blogs) our division is more useful. It is not unusual to separate off the foreign sector on the basis that it (mostly) uses a different currency (actually, multiple currencies), so we are going across exchange rates. It is also not that unusual to separate government from private, and is particularly useful in discussion of “sovereign currency”—which after all is the main purpose of this Primer. For convenience we add state and local government to the federal government even though only the federal government is the issuer of the sovereign currency. What is, admittedly, unusual is to add the households and firms together (as well as not-for-profits). This is in part due to data limitations—some data are collected this way. One reader perceptively noticed that a more common approach is to begin with the GDP identity (GDP = consumption + investment + government purchases + net exports; which equals gross national income). Without getting overly wonky, the GDP comes out of the NIPA accounts (national income and product accounts) that have some well-known disadvantages for those of us who worry about stock-flow consistency (the topic of future blogs). NIPA actually imputes some values and things don’t quite add up (a rather large and nasty “statistical discrepancy” is used to fudge to get to the identity). Just as one example: most Americans own their own homes, but certainly we all “consume” what is called “housing services”—the sheer enjoyment we get out of having some shelter over our heads in a rain storm. So statisticians “impute” (make up some economic value for that enjoyment), adding it to GDP. What we do not like about that is that no one really has to “pay for” the consumption of “housing services” for owner-occupied housing (say, you paid off your mortgage 5 years ago, but the statistician records $12,000 worth of enjoyment you consumed this year). Another area that is problematic comes in the treatment of saving. Typically, this can be done in one of two ways: either saving is simply a residual (your income less your consumption) or it is the accumulation to your wealth. In many calculations, when there is a real estate price boom, the value of the housing stock increases, which means our wealth increases, which must mean our saving increased. However, there was no income source that allowed us to save in financial terms. You can see that these are reasonably close approximations. Roughly, if private saving exceeds investment, then the private sector will be running a surplus; if taxes are less than government purchases, the government is running a deficit; and if imports exceed exports the foreign sector is running a surplus. We can get even more wonky and put in government transfer payments (things like unemployment compensation that add to private sector income) and international factor payments (flows of profits earned by American firms from abroad—that reduce our foreign imbalance). But we won’t do that here. We will usually work from the sectoral balances (thus, flow of funds) rather than from the GDP identity (NIPA) but you can do the mental gymnastics if you want to do the conversion. One commentator wondered why we would call an “imbalance” a “balance”: ie: if the private sector runs a deficit why would we refer to that as the private sector’s “balance”? Well, you have a checking account “balance” that is probably positive. If you write a check for more than your “balance” and if you have automatic overdraft coverage then you will now have a negative “balance” in your account! So, the “balance” can be either positive, zero, or negative for any sector. A final note regarding NAFA: I would just say that NAFA is the standard term from the stock-flow consistent literature, which, if Ramanan’s correct, ironically started in the UK. See Zezza’s paper here, which, independent of MMT, uses the same terminology. Further, it’s a term completely consistent with the accounting measure desired, while there’s not necessarily any reason to name items the exact same way as one particular nation’s accounts do (“net saving” being another example). Thanks for the comments. Keep them coming. Watch for Blog 3 next Monday. Stephanie Kelton recently sat down with Dara McHugh, Co-Ordinator of Dublin-based Smart Taxes, to discuss Ireland’s debt problems and the economic prospects for the Irish economy. 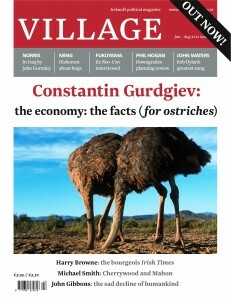 The interview appears in the June-August issue of Ireland’s Village Magazine. Dara McHugh (DM): Can you discuss the fundamental features – and the fundamental flaws – of the design of the Euro system? Stephanie Kelton (SK): The Euro is premised on a philosophy that is best characterized by the slogan, “One Market, One Money.” At the core of the Euro system is the European Central Bank, an institution that was given a limited but ostensibly critical role: keep a tight lid on inflation by strictly controlling the supply of euros. Because they could not conceive of an event that would trigger a breakdown in the payments system itself, the authors of the Maastricht Treaty did not give the ECB the statutory mandate to act as a ‘Lender of Last Resort’ in times of crisis. And, because a group largely composed of bankers (the Delors Committee) had written the blueprint for the Euro, it contained no systematic framework for regulating and supervising Europe’s financial institutions. Instead, the ECB was given a sole mandate: maintain price stability. These are significant departures from the customary modus operandi for a central bank. Because they assumed that a sharp decline in output and employment would be rectified through emigration or a depreciation of the euro, the authors of the Maastricht Treaty saw no reason to create a fiscal analogue to the ECB, an institution that would bear responsibility for promoting growth and employment in the Eurozone. Instead, the political intention of the Treaty was to subordinate the role of fiscal policy, leaving it to the individual member nations to cope with a downturn by permitting only a modest increase in their deficits. The problem, as everyone now observes, is that an individual member nation can find it impossible to engineer a recovery on its own. During a recession, the private sector retrenches, preferring to save or pay down existing debts rather than parting with cash or borrowing to finance new purchases. Without an offsetting increase in demand – from the public or foreign sector – unemployment will rise and GDP will decline. The Maastricht Treaty assumed that a small increase in the deficit, together with some emigration, would be sufficient to bring about a recovery. That was wrong. The bottom line is this: the Euro system contains a serious design flaw. It failed to recognize that it was designing a system that would cause its members to become more like Alaska, California or Utah than Australia, Canada or the US. That is, it was stripping them of their capacity to use their budgets to stabilise their own economies. DM: What are the key differences between the Euro and another currency, such as the US Dollar? SK: The primary difference is that the Euro can only be created by the ECB – it is the ISSUER of the currency. The governments of Ireland, Greece, Spain, Germany, etc. are the USERS of the currency. The implications of this distinction cannot be overstated. Members of the Eurozone are like individual states in the US. Like California, Ireland must go out and ‘get’ the currency – either by taxing or borrowing – before it can spend. It must pay whatever financial markets demand, and it can be priced out of the market. It can become insolvent, and it can be forced to default on its debt. In contrast, the Federal Reserve is the government’s bank. The government does not need to ‘get’ dollars before it can spend because it is the ISSUER of the currency. It simply spends by crediting bank accounts. It does not need to sell bonds in order to run a deficit, and it does not have to pay market rates. It can never become insolvent, and it can never be forced to default on its obligations. DM: How do these differences affect the response to the Euro-zone debt crisis? SK: The US has a monetary system that remains “wedded” to its fiscal system. The Euro system created a “divorce” between the fiscal and monetary institutions within each member nation. Because of this, members of the Eurozone cannot sustain the kind of deficits that can be run in the US. When rising interest rates and declining tax revenues force countries like Ireland and Greece into a substantial deficit position, they respond the same way Illinois and Georgia do – with massive spending cuts and tax increases to try to reduce the deficit. DM: What is your opinion about the current response adopted by the peripheral economies and supported by the ECB? SK: It is difficult to blame the peripheral economies for their response to the crisis (save Ireland’s bone-headed decision to add to its debt problems by bailing out foreign creditors). They are doing what they believe they must in order to avoid default and live up to the promises they made when they adopted the Euro. As it stands, Greece, Ireland and Portugal have no choice but to try to meet the terms of the EU/IMF bailouts by driving through massive austerity programs. It is a policy response that could only have been engineered by a group of economists who lack even a basic understanding of first principles, and it is already yielding disastrous and perverse effects across the periphery. Indeed, the European Commission has just reported that Greece’s deficit has failed to come down as expected. Any decent economist understands why. Pay cuts, layoffs, tax increases and the like will only reduce private sector incomes, dragging sales and tax revenues down along the way. Unfortunately, the EC has insisted that the government must push through even deeper cuts in order to satisfy the EU-IMF inspection team. This is the definition of economic malpractice. DM: Do you see any better solutions to the debt crisis? SK: First, let us be clear. What is currently in place is not a “solution.” The EU/IMF extortion program will not resolve the debt crisis – it will only prolong the ultimate demise of the Euro project. In order to preserve the “Union,” the ECB must recognize that the member governments are neither responsible for the debt crisis nor capable of resolving it. The ECB must recognize the design flaw in the Euro system and, like Toyota, inform its users that it will take corrective measures to fix it. My good friend Warren Mosler – an expert in financial markets – has pointed out that it took 10 years for most analysts to discover the flaw in the Euro system but that it would take the ECB only 10 minutes to correct it. The fundamental problem is that member nations have no safe funding mechanism under the existing system. To fix the problem, the ECB should create the euros that its member governments, as USERS of the currency, cannot. It would do this simply by crediting bank accounts, just like the Federal Reserve does when it transfers money to cash-strapped states in the wake of a national disaster. The funds could go directly into the member governments’ accounts, or they could be routed through the European Parliament, which could distribute them on a per-capita basis to all seventeen members of the Eurozone. Because these are transfer payments – not loans – the ECB would not seek repayment. A back-of-the-envelope calculation suggests that an annual distribution of about 10 percent of Euroland GDP would be sufficient to eliminate the funding risk, reduce borrowing costs, permit the repayment of debt and help to restore growth. If the ECB refuses to create a safe funding mechanism for its member nations, then there may be no alternative but to abandon the euro and return to the more conventional “One Nation, One Money” arrangement. DM: Why is currency sovereignty so important? SK: Because without it you are merely the USER of the currency, no different from an individual state in the US. You have no independent monetary policy and very little control over your budget. You are at the mercy of financial markets, and your only hope is that some other source of demand will emerge and drag you out of the trenches.